When an enemy ship at distance 1-5 changes its speed, you may exhaust this card to increase or decrease your speed by 1. This is an interesting card just based on all the interesting ways in which it can interact with other cards. First, as an exhaust effect, it can be prematurely exhausted with MS-1 Ions, and brought back for multiple uses in a single round by the Interdictor title. Why you would need to burn that title on changing your speed multiple times a round on a Speed 2 ship would be a niche case, but it's possible! The other interactions to look at are cards that force your opponent's ships to change speed. Phylon Q7 Tractor Beams and Admiral Konstantine can effect the speed of your opponent, giving you a free speed change. Maybe the most interesting interaction might be with Admiral Konstantine, which between the two upgrade cards can get a very significant change in relative speed at an odd timing point, potentially accelerating a ship from a dead stop even if your opponent is preparing to attack you with their first activation. Without speed change shenanigans, the Grand Inquisitor finds himself a home on ships that want to change speeds while also doing other things, besides navigating. Moff Jerry fleets will find him useful as the extra yaw from navigates isn't 100% necessary, but being able to pump your Arquitens up to speed 3 to avoid a nasty arc is a life saver. Gozantis or Quasars that want to push squadrons rather than navigate can also use this to speed away from a problem, or slow down to avoid running into something nasty's Medium range. An Interdictor that is spamming Engineering commands might want to speed up. An ISD pumping out Engineering commands to survive can speed up after making its pass to disengage. The final interaction to consider with this card is with Quad Battery Turrets. Because enemy ships fire, then move, it isn't exactly a good defensive upgrade or counter. But if you have Quad Battery Turrets equipped on your ship with the Grand Inquisitor, you can help ensure that you are always just a little bit slower than the opposition. 9 points for the combo mind you. There's quite a few options here to think of. 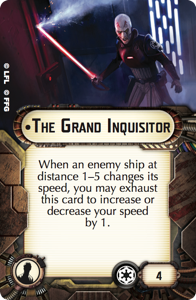 I don't think the Grand Inquisitor will be a common card in people's lists, but he might just find his way into one or two that take advantage of his unique timing. At the start of the ship phase, you may discard this card to choose 2 different command tokens and place them on 2 different ships. Then your opponent chooses 2 different command tokens you did not choose and places them on 2 different ships. Hondo really likes hanging out onboard just about any ship, specifically in a fleet that would otherwise be taking Veteran Captains for sudden token generation. The key here is he gives you 2 tokens, and doesn't have to be on a ship that is the recipient for the tokens. Throw him on a flotilla, what's another 2 points on a cheap ship? Throw him on your flagship if it doesn't have any officers. Hondo is 2 points that ironically wants to hide from the fight. No point in putting him on your combat ship, even if that's the one that needs the token. Hondo can work anywhere. One fun combo I saw Hondo being used with, was with the Phoenix Home Title, a Veteran Captain, and Shields to Maximum! With that, the Pelta would bank an Engineering token on the first turn. On the second turn it would use the banked token. On the third turn it would use the token from the Veteran Captain, and on the fourth turn, the token from Hondo. On the fifth turn, it would just burn the card. Four total turns of regenerating shields, and the Command dial was free to be used on anything at all after the first turn. The best part is that Phoenix Home isn't even necessary for that combo to work, just put Hondo on a different ship, and save 3 points! 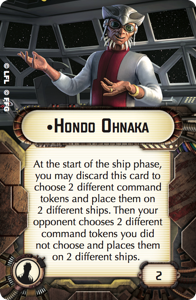 Another use for Hondo is to give a Boarding Party upgrade ship the Squadron token it needs before it gets to work. Again, this doesn't even need to be the ship using the boarding party. Hondo is just happy to help! Finally, Asoka can help keep Hondo in line. Maybe what you really need is a Navigate and a Squadron token, and you really, really don't want your opponent getting their hands on an Engineering token for their ship you're really close to finishing off. Well, give your ships the Navigate and the Engineering, and let your opponent sit on worthless (for them) Squadron and Concentrate Fire tokens. Then Asoka makes that Engineering token into the Squadron you always wanted. Tantive IV also lets you work a bit of a combo, potentially giving both tokens to the same ship. Who knows when and why you'd need to make this work, but it does! So which one of these are you more excited about? It's Hondo, right? Let us know! In other news Truthiness is almost done with another Corellian Conflict article, and I'm busy with Phase #2: Deployment. Stay tuned for some good articles! I'm not following the Pelta/Hondo combo. Turn 1: Engineering command, bank the engineering token. Turn 2: Use the token, discard Vet. Captain to get an engineering token. Turn 3: Use the token. (note: You say use Vet. Captain here but that wouldn't work. 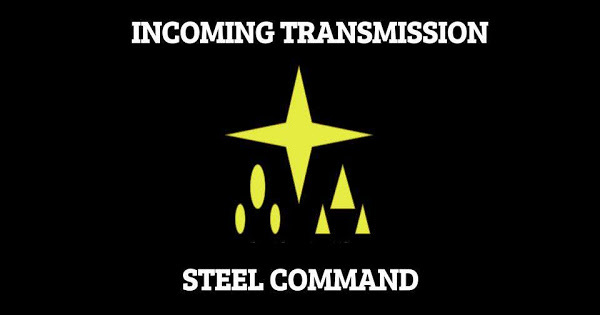 All Shields To Maximum happens at the start of the ship phase and Vet. Captain happens when you reveal a command dial. Turn 4: Use and discard Hondo for an engineering token, spend that token. Turn 5: You say "it would just burn the card". Not sure what you're talking about here as both Vet. Captain and Hondo have been discarded earlier in the game.